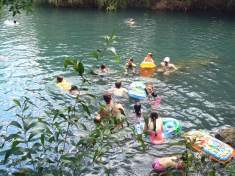 Berry Springs Nature Park is a popular swimming and picnic area with several pools and a small waterfall fed by crystal clear spring water and surrounded by natural bush. About an hours drive from Darwin on the Cox Peninsular Rd. 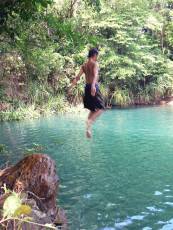 this is probably the most popular of the bush swimming pools close to Darwin. Swimming has been closed for 2018, expected to reopen May 2019, depending on conditions. The picnic facilities remain open. Next door is the Territory Wildlife Park with it's crocodiles, birds, wallabies and aquariums on display. The biggest of three pools, looking upstream towards the waterfall. 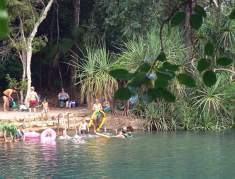 A low weir keeps the swimming pools full, while below the weir is crocodile country and swimming is definitely not recommended. 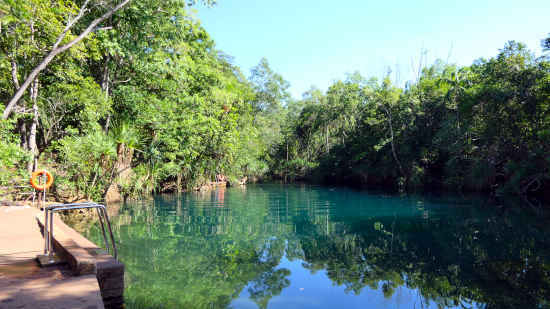 A rusty diving platform visible in the photo (above left) is from a time when crocodiles had been hunted close to extinction. Like Howard Springs, the area was developed during the Second World war as a rest and recreation area for troops and has been upgraded over the years to provide an excellent facility. 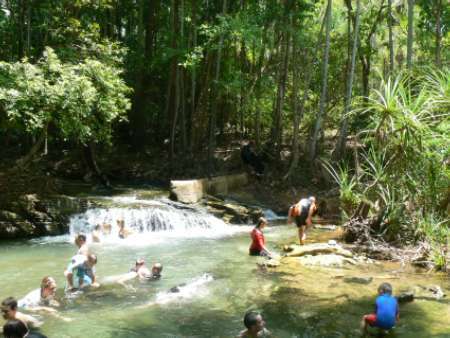 There are three main pools along a length of the creek, beginning with a small waterfall and shallow pools suitable for smaller children running into larger, deeper pools and finishing with a small weir. 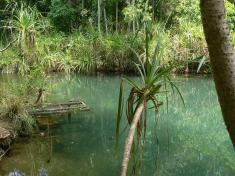 If you swim with goggles you can see many small native fish and other aquatic life that live in the clear pools. The Park is open from 8.00 am to 6.30 pm daily, usually from around late April to late December. The Kiosk is open from 11am - 5.30pm daily from April - November. As part of the Berry Creek catchment, the area can become flooded during wet season rains and is closed for safety reasons. If you are interested in plants, visit the Park during March and April when many of the native plants are in flower and the grasses are still green. 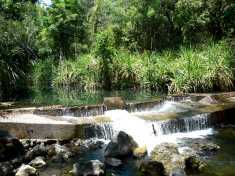 A Park Information Centre has pictures and descriptions of the native fish in the pools and the birds, lizards and other animals that can be seen around the park, including small wallabies and water monitors.